Encrypt.me VPN is a startup that created a nice looking website, app, and product that makes it easy for beginners to get into using a VPN… is that all or is there something more? Encrypt.me VPN prides itself on keeping clients safe and secure while connected to untrusted networks, a common occurrence on public hotspots and Wi-Fi networks. 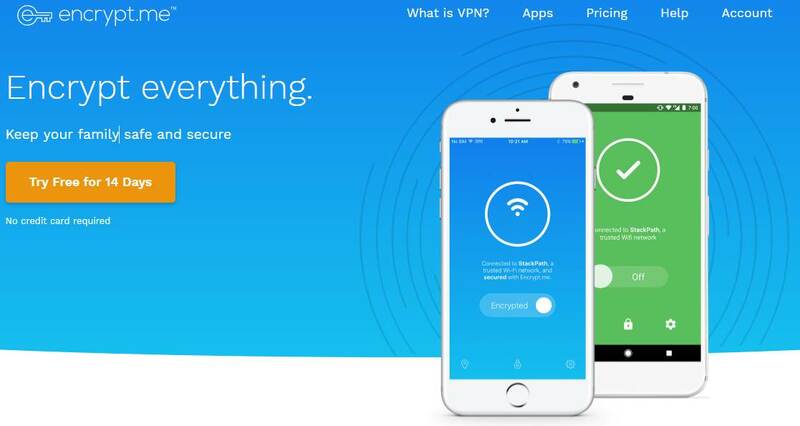 This VPN claims to encrypt you from browser leaks, Wi-Fi eavesdropping, and broadband spying all while being a simple product. Encrypt.me VPN hides your IP address and cloaks your data—they make an encrypted connection between your PC or smartphone and the VPN server to the destination (the websites you’re visiting). This interfaces with the Internet and all your online activity that goes through it, cloaking your identity and what you’re doing. Let’s find out if Encrypt.me VPN lives up to its name and what makes it stand out from the competition. Speed is one of the major factors that we look for in a VPN. We ran different speed tests using varying transporter and server locations. Encrypt.me shows promising speeds – a loss of just below 30% which is usually a good indicator of speed. Needless to say, Encrypt.me VPN did a solid job, with no noticeable throttling. Nice work, Encrypt.me – we like speedy VPNs! IP and DNS Leak Test: Nice, no leaks! When it comes to IP and DNS Leak Test, Encrypt.me VPN lives up to its name. True to their words, there’s no sign of leaks of any kind when using Encrypt.me VPN. While using this VPN, you can sit back and relax; Encrypt.me will keep you safe. Encrypt.me features IPSec protocol with 1536-bit minimum DH group encryption on iPhone, iPad, and iPod Touch devices. They use an open-source protocol called strongSwan, and the IPsec config prefers AES128, SHA256 and MODP2048 for IKE(v1), and AES128 and SHA256 for ESP. Windows devices run on a strongSwan as well. For their Mac and Android services, they use OpenVPN protocol and SSL/TLS VPN solution with a custom-generated 2048-bit DH group encryption. OpenVPN uses DHE key exchanges by default, securing your information. In layman terms, the encryption is extra strong (did you not get that with all the cool numbers and codenames?). With these kinds of encryption standards, you’re good to browse safely. This VPN lacks a traditional kill switch but they offer an industry-first feature called “OverCloak” that they claim acts as a strong kill switch equivalent. They explain how it works here. Sounds like a kill-switch to us, just with a fancy name! If you realize you’re not satisfied with Encrypt.me VPN after purchasing a month-long worth of service, don’t worry; just hit them up with an email request for a refund. If you purchased a service to their website, you will definitely get back your payment within 30 days of purchase. However, Encrypt.me won’t be able to get you, your money back if you purchase a service through one of their applications. But don’t fret; in this case, you can contact iTunes Support and request a refund through them. 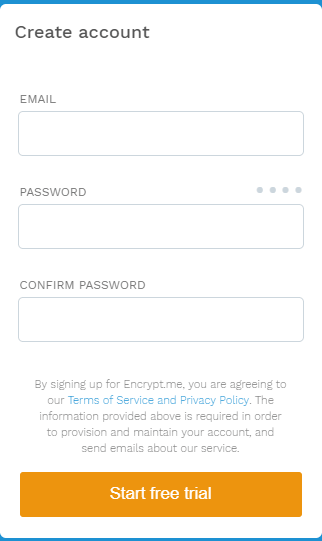 Signing up for Encrypt.me VPN is fast and easy. Just provide your email and password and you’re good to go! 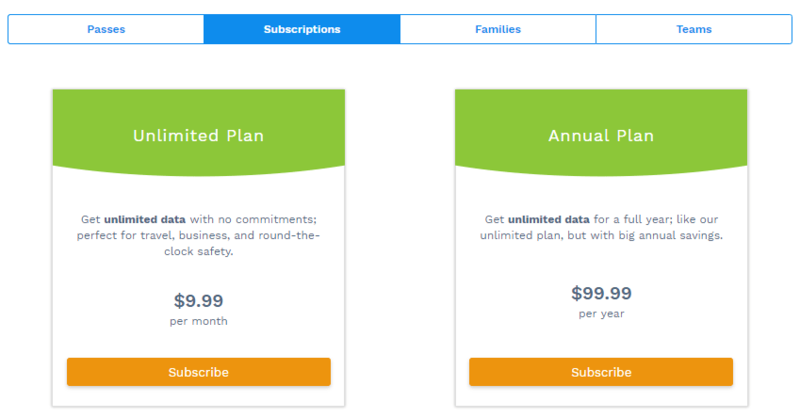 You can sign up for a 14-day free trial or jump ahead and pick up one of their plans. Either way, signing up isn’t a problem. Their interface is neat and simple and makes using the service a simple and easy affair. When you log-in to Encrypt.me VPN, it automatically detects your Wi-Fi network and lists it as untrusted. The application is set to turn on every time you’re connected to an untrusted network. Nice safety feature for the user! If you trust a connection like the one in your home, you can add it to the list of trusted networks in the network section of the settings. If you try to connect or change the server in the application’s main screen, it won’t do anything. It’ll only change if you go to the Transporter section of the settings and change it directly in there. It’s a bit hassle but once you’re encrypted, you’re good to go. 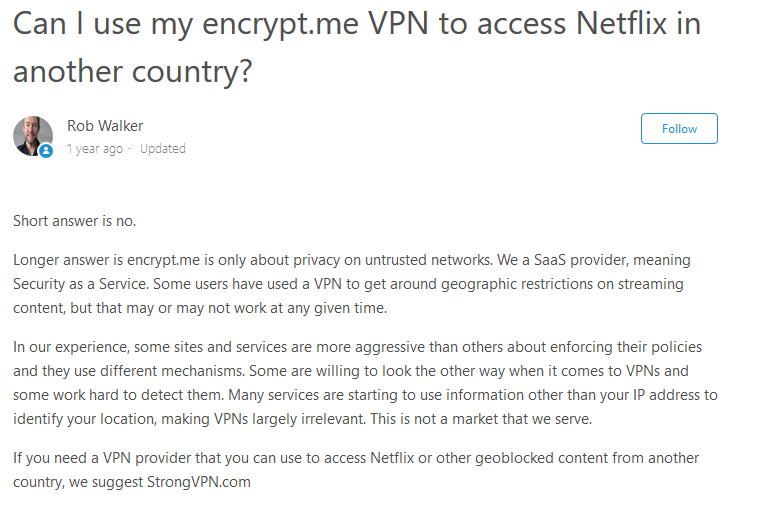 One more thing: Encrypt.me doesn’t warn you if the VPN fails or successfully connects you to the server, so you may be unprotected for a moment and not even know it. We don’t like that one bit; VPNs are about security, and for one with “Encrypt” in their name, we’d like to see them keep users informed of what’s happening at all times (Internet security is no laughing matter, Encrypt.me!). Compare to other VPNs, Encypt.me VPN does not offer a wide selection of payment options. They only accept Visa, Mastercard, AmEx, Discover, and JBC Cards. They do not offer cryptocurrency, so anonymity-seekers: no bueno. It’s also worth noting that when you sign up to purchase a service, your billing information will be directed and stored into Braintree’s Payment System’s secure credit card vault. Encrypt.me can work on the following device types—iOS, Android, macOS, Windows, and Amazon Fire. So, if you’re a simple person with simple needs, this will do. This is perfect for beginners but a turn off for advanced users. There are no native routers or Linux setups. They also don’t support TOR browsing. For all techies out there, yeah, it doesn’t look good, but there are other VPNs with full device support. Encrypt.me doesn’t have the largest network of servers, with just 55 servers across 23 countries and 6 continents around the globe. It’s not the most expansive network, especially in the VPN Market where many VPNs offer thousands of servers. However, Encrypt.me VPN has decently optimized servers considering the speed tests. Still, we’d like to see more choice – a lot more. There’s no denying that Netflix is a tough nut to crack; that’s why finding a good VPN that allows us to watch our favorite series and movies on Netflix is a must for some. 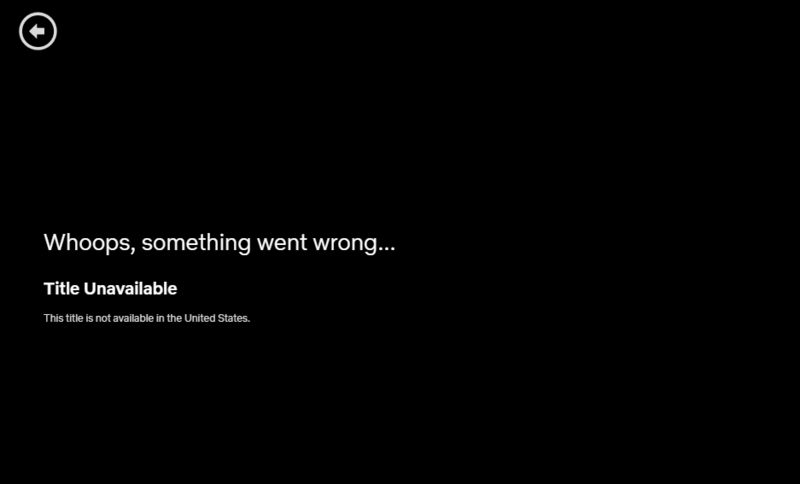 In our tests, Encrypt.me failed to unblock Netflix, meaning it’s no use for users looking to binge-watch series. It works on some US-based servers, but it took us 3-4 servers before we found one that works. Finding a server that works with Netflix with Encrypt.me’s service is luck, pure and simple. Encrypt.me VPN notes that their top priority is to ensure privacy on untrusted networks. If you’re a torrent-addict, this VPN also falls short. Encrypt.me VPN blocks any protocols regarding peer-to-peer file sharing or any piracy websites by default. They made clear that this is not the appropriate VPN to download copyrighted material. For those looking to torrent? Seek services elsewhere, starting with the best VPNs for torrenting. 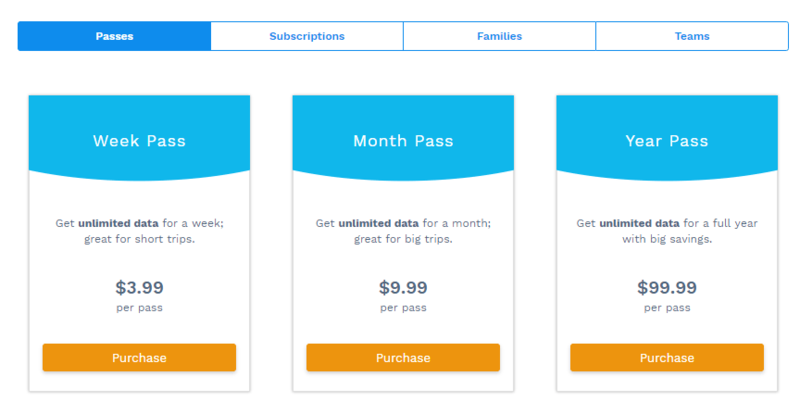 Encrypt.me VPN offers a range of subscription plans; they start with a weekly pass costing $3.99 ideal if you’re on a short trip, but pricey. They also have a monthly pass worth $9.99, and a yearly pass worth $99.99; again, expensive. 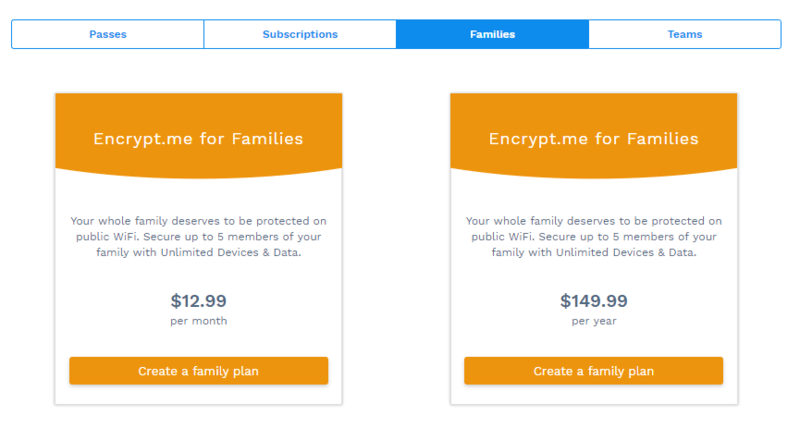 Encrypt.me VPN doesn’t stop there – they also have family and team plans too. 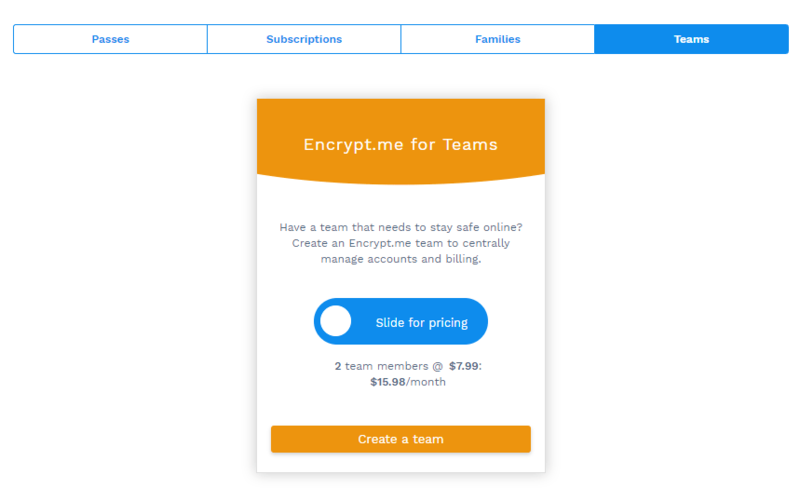 The offers range from $12.99/month to $149.99/year for 5 family members and $15.98/ month for 2 team members; so if you’re set on going with Encrypt.me, it might be cost-effective to buddy up and buy together, splitting the cost between you all. If you don’t want to jump right in, Encrypt.me VPN offers a 14-day trial. No card required. Fairly generous! Customer Support: Well, where is it? Customer Support is not where Encrypt.me’s service shines, let’s start with that. Like most other services, they offer a knowledgebase you can browse for answers to your questions. However, Encrypt.me VPN doesn’t offer a live chat option – something that makes our VPN-loving eyes light up when we see it. They also don’t have a ticketing system. Wait, what? No support system? Well, not exactly. They have a “Contact Us” button that redirects you to your email account. Unfortunately, it took them a few hours to respond. 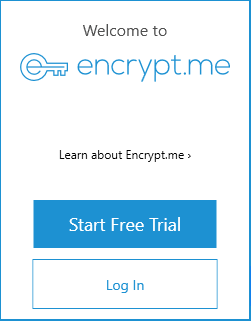 We’ve seen much much better support services – oh Encrypt.me, why do you do this? We believe this also goes back to the company being a startup. Lack of funding, lack of resources for proper customer support. Let’s not beat around the bush – they log some of your information. 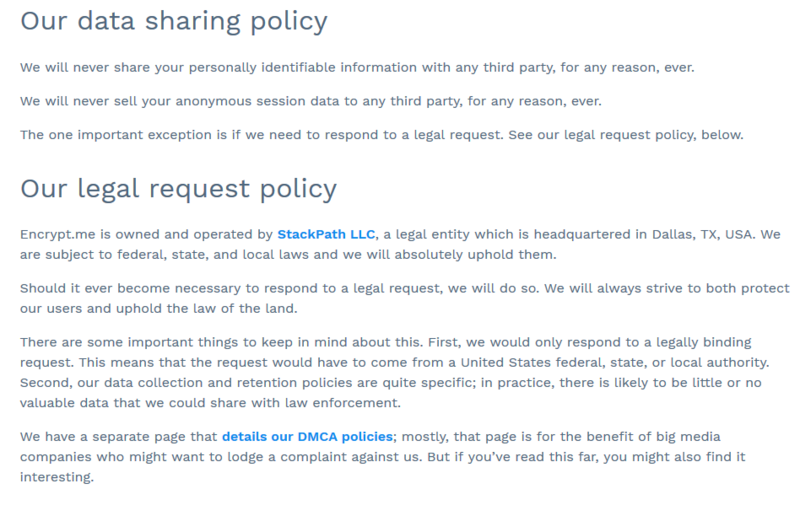 It’s emphasized in their Privacy Policies. They keep personal information for sixteen (16) days and delete it once that time is up. Not exactly comforting; that’s plenty of time for your information to be passed on to authorities and government agencies. A team made of engineers, designers, business strategists, and product perfectionists—Encrypt.me aims to keep people safe from untrusted networks. Founded in 2011, Encrypt.me is owned and operated by StackPath LLC. Wait a minute, StackPath sounds familiar. Yes, it’s the same StackPath that owns IPVanish. Encrypt.me started from the idea that an individual’s data should be secure while working from cafés and public spaces. Believing that VPNs at the time were difficult to use, their team chose to manufacture the least demanding service to protect user privacy and browsing activities. Previously known as “Cloak VPN,” their first open beta opened in 2012. In April 2016, Cloak joined the StackPath group. In June 2017, the name “Cloak” was rebranded to Encrypt.me. Currently, the company has offices in Seattle, Dallas, and Orlando. Encrypt.me VPN is a US-based VPN headquartered in Dallas, USA. This means that when the US government calls, they are bound to comply with government requests for data collection. If that happens, consider that other members of Eyes Alliance now have access to the same information in their database. Not great if you’re doing questionable activities (we’re side-eyeing torrent users right now), not that you can even do that with Encrypt.me in the first place. 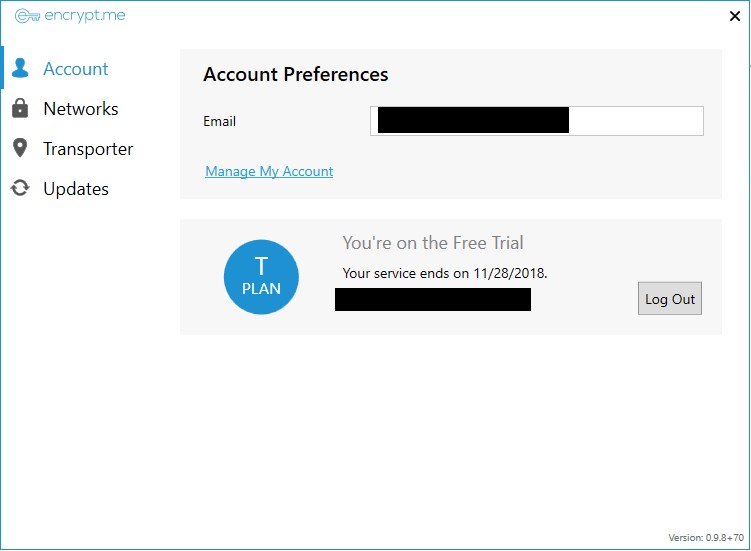 Some features of Encrypt.me VPN are perfect for beginners: they don’t throttle speed, they provide a clean interface plus a generous 14-day free trial. However, if you’re looking for a good VPN to invest your money with, don’t bother with Encypt.me VPN – doubly so if you’re experienced with the use of VPNs. There are other VPNs out there that don’t log your sessions, allow Netflix and torrenting, and provide healthy levels of customer support. Encrypt.me VPN is pretty basic and there’s a whole lot out there that provide top features at cheaper prices. To get you started, we recommend you check out our top 10 list.